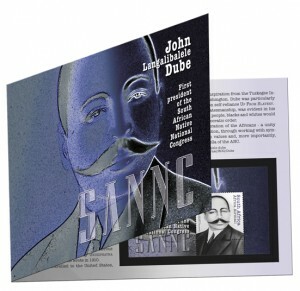 A new stamp issue by the S.A. Post Office on the 22nd February 2012 celebrates the Reverend John Dube, with great design, as always, by Thea Clemons and photos from the Robben Island Museum, Mayibuye Archives. John Dube has been described as a scholar, gentleman, leader, farmer, teacher, politician, patriot and philanthropist, Rev John Dube was the first President General of the ANC. He was also actively involved in the Bhambatha Rebellion regarded by many as the beginning of the struggle against apartheid. It culminated 88 years later almost to the day with the first democratic elections in South Africa on 27 April 1994. John Dube was born in Natal (now KwaZulu-Natal) in 1871 of a royal Zulu lineage at the Inanda mission station of the American Zulu Mission. He was raised as a Christian as his father had converted to Christianity and his formative influences came from the Mission. Dube took great pride in his Zulu past and throughout his life, he navigated between his Christian spirituality and his Zulu ethnic roots, which often came into conflict. 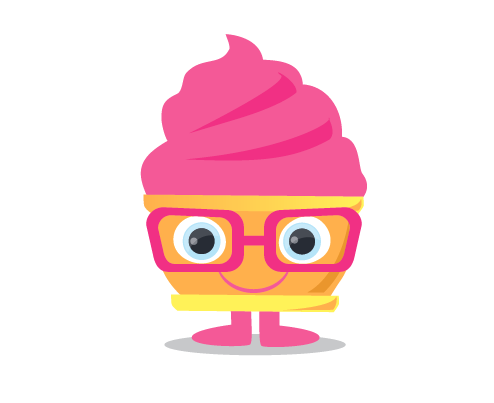 In 1887, Dube left for the United States of America where he studied at Oberlin College. In 1901, he founded one of the first schools of higher learning for indigenous peoples, the Zulu Christian Industrial School, later renamed the Ohlange Institute. Dube led a public life as an educator, orator, writer, news-paper editor, and an international civil rights leader. In 1912, he became the founding president of the South African Native National Congress (SANNC) later renamed the African National Congress (ANC). In 1914, he led a deputation of SANNC to Britain to protest against the Native Land Act. Known to his countrymen as ‘Mafukuzela’, Dube exercised great influence, and was moderate in his views. In 1903, Dube and Nganzana Luthuli, an eminent African journalist, co-founded Ilanga Lase Natal (The Natal Sun), a Zulu language newspaper of which Dube later became editor. He was also the author of the first historical novel in Zulu, titled Insila kaShaka (1930). It was translated into English in 1951 as Jeqe, the Bodyservant of King Tshaka. In addition, Dube wrote biographies of the Zulu royal family, especially that of King Dinizulu, making him the first biographer in African literature. There are also numerous other works such as the essay Ukuziphatha (On Behaviour), which he wrote in 1910. 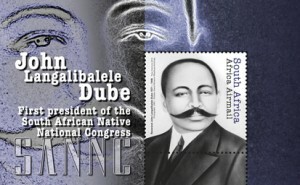 Dube’s democratic nature, as well as his statesmanship was evident in his belief that despite the oppression of the African people, blacks and whites would eventually be able to live together under a democratic order. He fought all his life for the unity and liberation of the Africans – a unity and liberation he saw as coming through education, through working with sympathetic whites, through adoption of Christian values and, more importantly, through political organisation under the umbrella of the ANC. 2 Comments on "S A Post Office Stamp Issue on Rev. 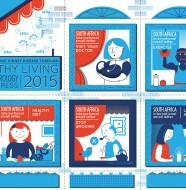 John Dube"
Interesting. will you guys do the same for people like Robert Sobukwe; Steve Biko etc or you only consider ANC leaders. 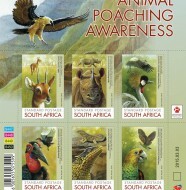 Hi Themba, thanks for your comment, we only report on the stamps issued by the SA Post Office. 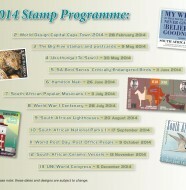 If they issue any stamps we will report on them. Perhaps it is because of the ANC centenary that they are issuing these ANC heroes?